10 Reasons You Need a Humidifier! The new addition to my home that has made a huge difference this winter– a humidifier! Humidifiers are a great way to stave off those nasty symptoms caused by dry winter air: itchy skin, restless nights and sinus pain anyone? Believe it or not, a humidifier can even help you save a few bucks. Woop, woop! Humidifiers are great for purifying the air in your house and keeping your nasal passages lubricated. These are both super important when healing a cold or flu. By adding moisture to your space, you will feel more comfortable and get rid of those nasty symptoms sooner rather than later. Dry air doesn’t allow your sinuses to drain properly, so sinus pressure and tension headaches can show up more frequently in the winter. With an increase in humidity, your sinuses will be in tip-top functioning mode and you will alleviate sinus pain caused by infections and made worse by the relentless dry air of winter. Dryness in the throat can lead to trouble breathing while you sleep. A humidifier will allow you to breath better and sleep better which will make you feel better. Win, Win, Triple WIN. Also if you or your partner are prone to snoring, a humidifier will alleviate dryness in the throat and/or relieve sinus congestion, both big snore causing culprits. I crank the heat in the cold Minnesota months, so I’m familiar with dry, damaging effect this can have on my skin, especially my face, lips, and hands. Keeping a humidifier on throughout the night helps reduce that dry, uncomfortable air and it keeps your skin feeling smooth and refreshed the following morning! Winter marks the season of runny noses and sore throats, but by adding a humidifier to your home and taking a step to prevent infections, you can say buhh-bye to these winter nuances. Because humidifiers help you get better sleep, your body will be stronger to fight off infections. Also, I recently learned that flu germs thrive in dry areas (yikes), so adding moisture to your home can help eliminate those germs. Having too much or too little moisture in the air can cause wallpaper to peel, wood to split and paint and furniture to crack. By regulating the humidity in the air, you will be taking care of not only yourself but also your home. I have been spending extra time lately sprucing up my apartment with new pieces of decor, so I want to make sure I’m taking care of them! Having dry, itchy skin or feeling under the weather (both common in the winter) are big bummers and can be super distracting. For me, it’s important to feel comfortable and put-together when I am working from home, so I like to keep my humidifier running to keep these distractions at bay. By creating a comfortable space, you may notice an increase in your productivity around the house without being distracted by dry skin or illnesses! Utility bills are notoriously high in the winter from cranking up the heat. Well, GOOD NEWS a humidifier can actually help you save money on this necessary evil in the winter time. Moisture retains heat which means adding a humidifier will make your space feel warmer without you ever laying a finger on that thermostat. Indoor air, especially in the winter, can harm plants if too dry. The added moisture provides a comfortable space for your indoor greenery to thrive. I’ve had a few mishaps keeping my little guys alive, but I love that by having a humidifier, I’m taking an extra step to make sure my new plants are taken care of. Nosebleeds are a common and annoying symptom of dry air in the winter. If you experience regular nosebleeds during the winter months, a humidifier can keep those nasal passages moist and free from frequent nosebleeds! 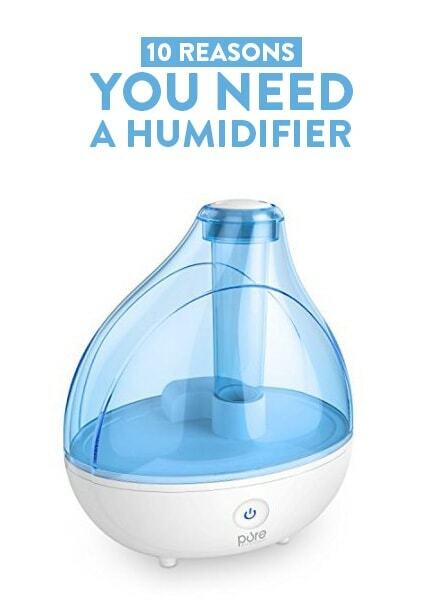 Check out my top humidifier pick from Amazon– Pure Enrichment Humidifier! It is affordable and good quality, so you will be able to use it year after year. I highly recommend!